The Reverend Spencer Jones and his cup. A hundred years ago the Reverend Spencer Jones1 was the Rector of Batsford with Moreton-in-Marsh. He became Rector in 18872 and remained Rector for over 40 years3. 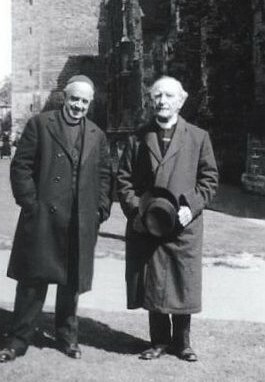 In his later years he was assisted by the Revd. Edward Spencer Jones (whom I believe was his son4), who was curate from 1925. Members of the Four Shires Guild remember Spencer Jones because he presented the Guild with a cup (The Spencer Jones Cup), to be given to the winning team at a striking competition. Spencer Jones was an Anglo-Catholic and was frequently referred to as Father Jones. He was the author of three books, The clergy and the Catechism (1895), England and the Holy See (1904) and Our Lord and his lessons (1907). He was prominent in putting forward the view that there should be unity between the various churches and he felt that there should be union between the Roman Catholic and Anglican churches. He is credited with starting the Week of Prayer for Christian Unity along with the Revd Lewis T Wattson, Rector of St John's Episcopal Church in Kingston, New York, USA. Father Jones preached a sermon in favour of Anglican union with the Roman Catholic Church at St Matthew's Church, Westminster in 1900. His address was published and printed by Longmans (1000 copies). In 1907 he addressed a meeting of the Roman Catholic Guild of Our Lady of Ransom at the Caxton Hall, Westminster. Responding to a critic he declared, The real scandal is that we are divided, not that we try to meet . By 1908 there was inaugurated a Church Unity week. This has become known as the Week of Prayer for Christian Unity. Each year between18th & 25th January we pray and work for Church unity. From a small beginning the movement for Church unity has grown and is kept 'worldwide'. Revd Dr Peter Newing (Vice-President). 1 An internet entry records his middle name as John; and the 1891 census record (see below) supports this by giving his middle initial as 'J'. 2 In 1887 Moreton was removed from Bourton-on-the-Hill parish and annexed to Batsford. Spencer Jones was therefore the first Rector of the newly-formed ecclesiastical area. 3 Until 1932. I have been unable to discover whether he retired from his incumbency then, or whether it ended on his death. (This record tells us a great deal. Firstly, it tells us Spencer Jones was 34 in 1891, so he was born in1856 or 1857, and therefore was 75 when his incumbency of Moreton ended. He was born in Croydon, Surrey. His wife was 7 years older (41) and she came from Eling, Hants (as did her elder sister, Caroline, who was there at census time: was she living with them?). His son, Edward S (S for Spencer: see later), was 4 at the time and was born at Balham, Surrey, so Spencer Jones' previous incumbency may have been there. His daughter was only 7 months old and was born at Moreton. Alfred Hands, another clergyman, seems to have been visiting at the time. The Jones appear to have employed a nurse, aged 17, and a housemaid, aged 15, and presumably they lived in. As with many items of property belonging to societies that cease to exist, the 'old' Guild's property dissipated, ending up in nooks, crannies and wherever. Some items have never been found (hopefully they will be one day), the most significant of which, of course, is the original Shield. But some items have appeared, and one of these is the Spencer Jones Cup. This Cup is the only trophy that survives from the pre-WW2 Guild. It is arguably our greatest treasure. It was made in 1929 by the Guild of Handicrafts in Chipping Campden, very likely by George Hart, but certainly to George's design (so David Hart tells me). It is truly a beautiful and elegant thing. Campden 1929; Ebrington 1930; Wolford 1931; Mickleton 1932; Wolford 1933; Mickleton 1934; Wolford 1935; Campden 1936; Mickleton 1937; Wolford 1938. However, the Cup carries a mistake. Around the stem is engraved 'THE SPENCER-JONES CUP', the hyphen implying the Revd Jones' surname was double-barrelled, ie Spencer-Jones! 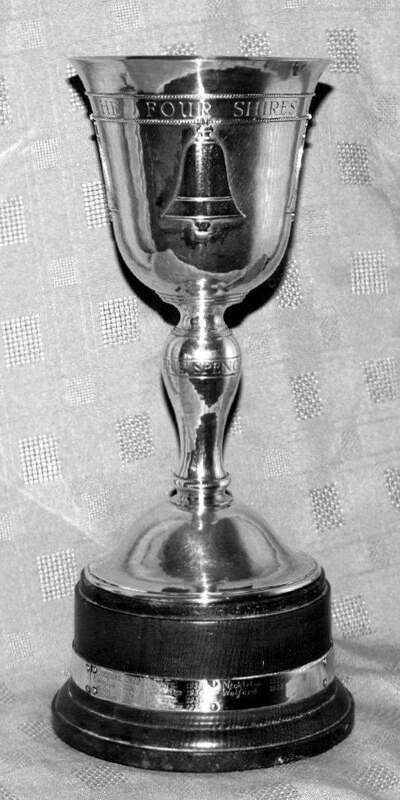 The Guild history tells us the Cup was discovered at Wolford, as they were the last winners. I assumed it was found by Tony Brazier, although Phyllis thinks not. I've tried to unearth the details of its discovery, but have failed. If anyone knows these details, perhaps they could let me know. It would be nice to record what happened and by whom. Mention of the lost pre-WW2 Shield prompts a reminder to members that Peter Newing provided the Guild with a replacement shield, the Newing Shield, in 1979, for which we shall be forever grateful.